It seemed heretical; like Christmas without Santa, toast without butter or America without apple pie. The Illinois Central without double track? But that was to be the way of it. Under the leadership of Edward Moyers, the Illinois Central was going to whittle itself down from a double track ABS railroad to a single track CTC operation. Sure, in some ways CTC would be a vast improvement over the previous system. Rather than issuing a written authority to permit a train to occupy or move over the mainline, a dispatcher could directly control traffic for hundreds of miles of railroad with little more than a desktop computer. But that lack of a second main track could become problematic with the potential for bottlenecks developing; not to mention the headaches that ensue whenever a train breaks down on the single track. On the surface, the move seemed to make some sense. 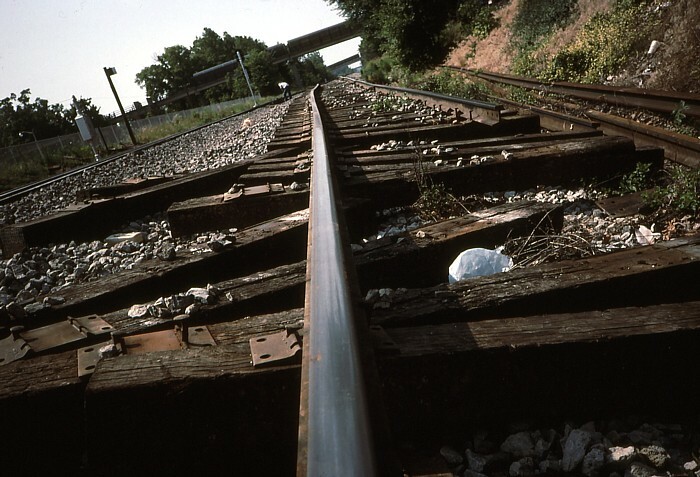 The railroad could save big money on track maintenance by removing one of the main tracks. Add to that the direct control by dispatchers of the passing sidings to remain in place every twenty miles or so, and the level of traffic that existed in the late eighties would be easily handled by a single track railroad. At the same time, the move was a capitulation. The railroad was, in effect, publicly giving up on the future. It could have been inferred that the railroad was announcing that “we have excess capacity, and we believe that we will never again have the traffic to need that capacity in the future.” Recent history having been what it was, the rebirth of the railroad industry that would come in the next two decades would have seemed like a pipe dream in the minds of dreamers not necessarily strongly grounded in reality. So as 1990 dawned, the Illinois Central was drawing up plans to remove nearly half of its mainline. 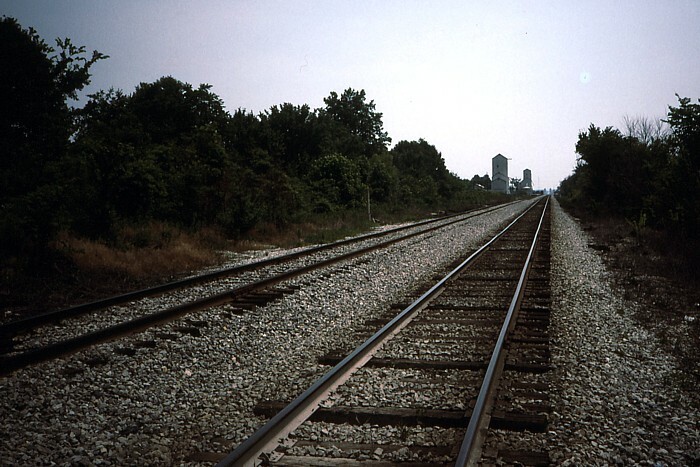 Carbondale, Illinois, was to be the location of one of the passing sidings. 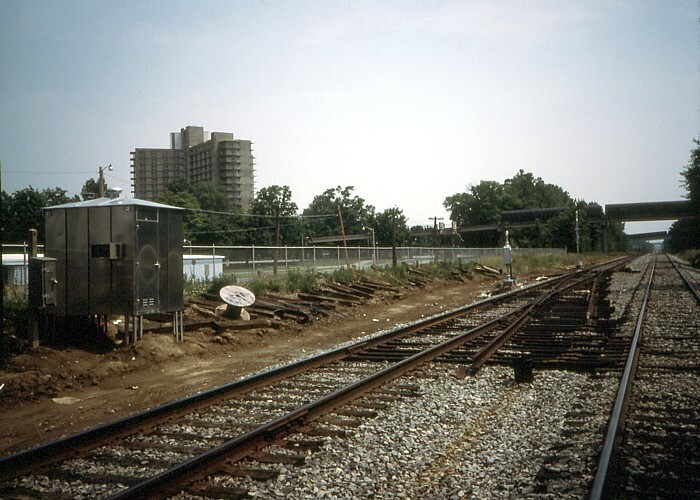 The north end of the siding was to be just north of Dillinger Road at the north end of North Yard. The location was to be known as North Carbondale. 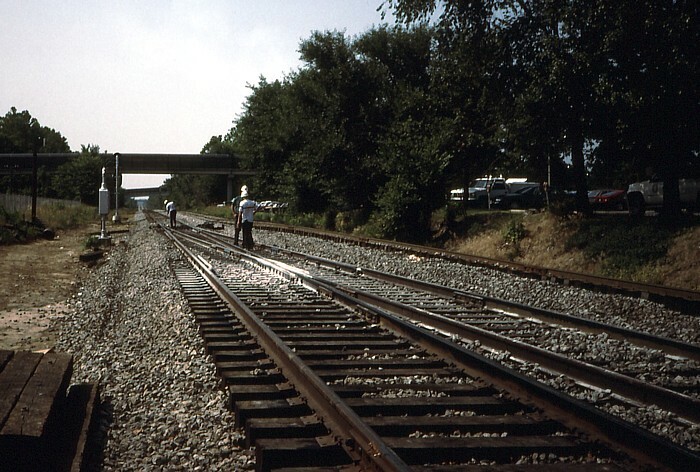 The south end of the siding, South Carbondale, was to be located just south of Grand Avenue across the street from the campus of Southern Illinois University. As June became July, it was plain that the changeover was not far away. Just north of Dillinger Road, a shining new metal shack for housing the North Carbondale control circuitry had been put into place. Just north of what would become North Carbondale, the double track looked as it had for decades. Within two months, the track on the right would be out of service and waiting for the scrappers to pick up the unused rails. 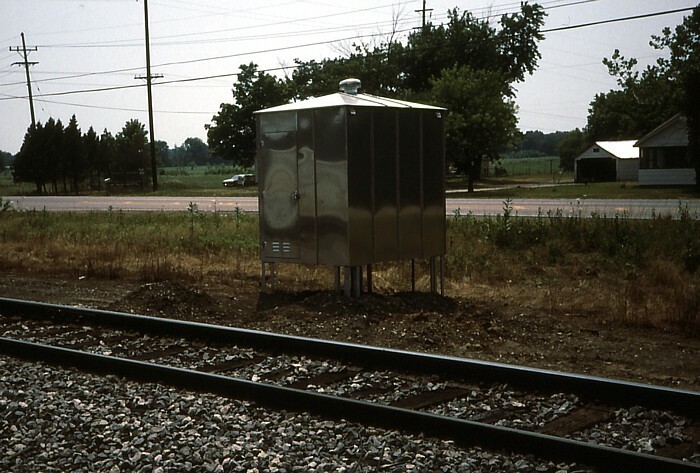 A the soon to be commissioned South Carbondale, the new power switch was in place along with the control box on July first. 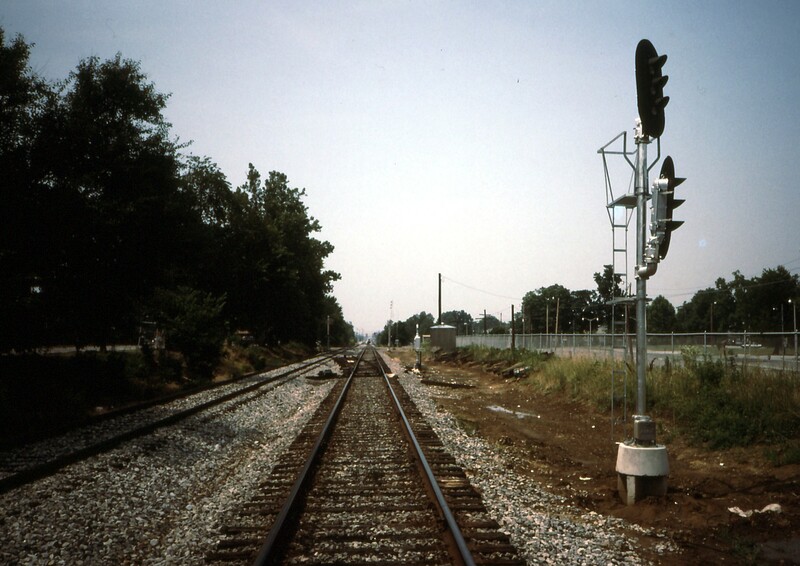 The new signals were installed, pointed off to the side to indicate that they were not yet in service. Just over a week later, on July 9, I photographed my last train heading south out of Carbondale on the southbound main. GP38-2 9622, an Illinois Central Gulf original, and former Gulf Mobile & Ohio SD40 6060 were on the point for one last view of a railroad in the in-between stages, between what it had been and what it would become. Later that morning a visit to the Dillinger grain elevators found an Illinois Central track crew installing the new switch for North Carbondale. Ten days later was the day that South Carbondale became an official location on the Illinois Central map. I was unaware that the work was being done that morning, and just happened to be out with my camera loaded with Kodachrome when I noticed what was going on. 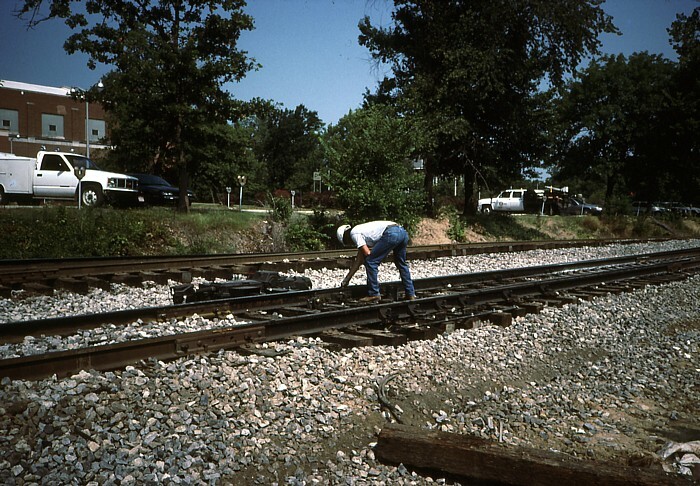 By the time I arrived the rails had already been cut and bent over, and connected to the South Carbondale switch. As I watched, track machines cleaned and tamped the ballast as the new junction was readied for service. 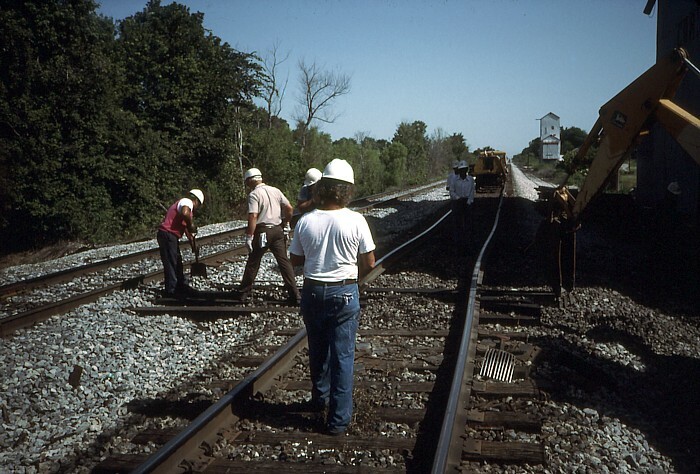 Once the track machines finished their work, gang foremen inspected the work before pronouncing the junction fit for service. As the new junction was being inspected, I placed my camera on the head of one of the now out of service rails that had been shoved aside. To me the odd angle of the shot represented how the traditional railroad scene of Carbondale had be skewed by progress. The foreman finished inspecting the switch. After a few moments, he went to his truck and called the dispatcher to let him know that South Carbondale was ready for service and the CTC system had been cut in. It wasn’t a moment too soon either, as in the meantime a headlight had appeared on the horizon. Its source had pulled up to a stop in North Yard. 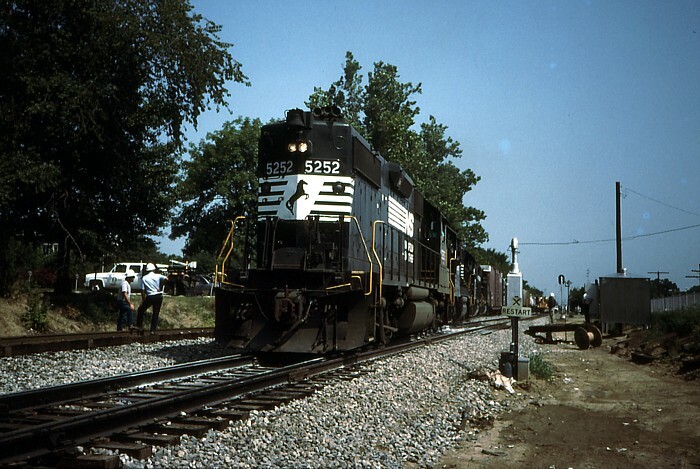 Once it was cleared for service, the dispatcher gave the signal for the first train to pass South Carbondale. It turned out to be something of a bit of irony, as that first train turned out to be a Norfolk Southern train. As GP38-2 5252 led southbound #123 through the junction, the Illinois Central was officially a single track CTC Railroad south of Carbondale, Illinois. Thanks Mary for your fantastic photo-essay. the ic was single tracked in 1993 for the most part, not 1990. It always amazes me the certainty with which some will comment when they have bad information. The I.C. was in fact single tracked in 1990. The installation work was going on as I completed my senior year of high school (memory may get worse with age, but the fact that we had our 20th reunion in 2010 might lend credence to the year). 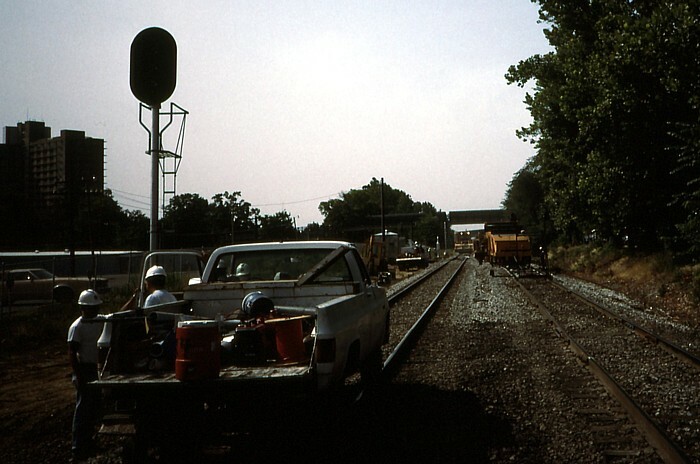 By 1993, I had been shooting photos and occasionally video of the single tracked railroad for several years. Trust me, I lived along the Illinois Central my whole life and now work the same line. Do your homework. Or, failing that, take the word of those of us who lived it. I have to disagree with the conclusions made had the double track main remained as it was I suspect there would be no mainline at all. Previous and later corporate heads did there best to drive traffic to the trucks and they were successful at doing so. The single tracking was and is a good idea. 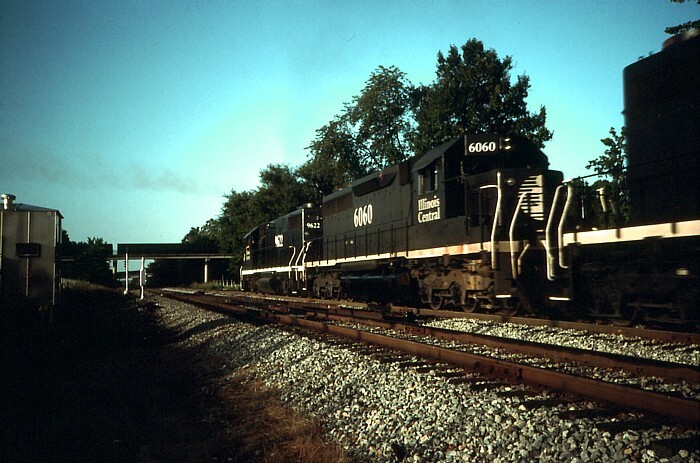 It has cut cost allowing the railroad to be competitive and that second main can be installed or simply more or more frequent passing sidings installed with little hassle. Had the old second main remained in place any reinstating would have to deal with rehabbing the old track or removing it. If the traffic returns there is no fighting with the locals to expand the ROW. I would like to see the second main return but from the traffic out there I don’t see a need for a second main. With the current economy, capacity is a considerably lessened issue. However, when traffic is up it can be a nightmare trying to get over the road. A single track line depends on everything running smoothly. I remember one morning at Crenshaw, Mississippi, when we were stuck for four hours when C.N. turned loose a train out of Memphis without fueling the locomotives and (wouldn’t you know it) they both ran out of gas within fifty miles. More than once I have been on an Amtrak train that suffered a locomotive failure on the single track and brought the whole railroad to a standstill. At the time the second main was abandoned, the future rail boom was not even a blip on the horizon of most rail executives. Cost slashing and retrenchment was the industry paradigm. If that boom began five to ten years earlier, I have to wonder if a CTC project may have been undertaken with a lot less shedding of capacity. The project as it happened banked on traffic not returning to any great degree. The end result is that the railroad is left with minimal prospects for growth. This is exacerbated by the project that leased the former second main right of way for laying of fiber-optic cable. 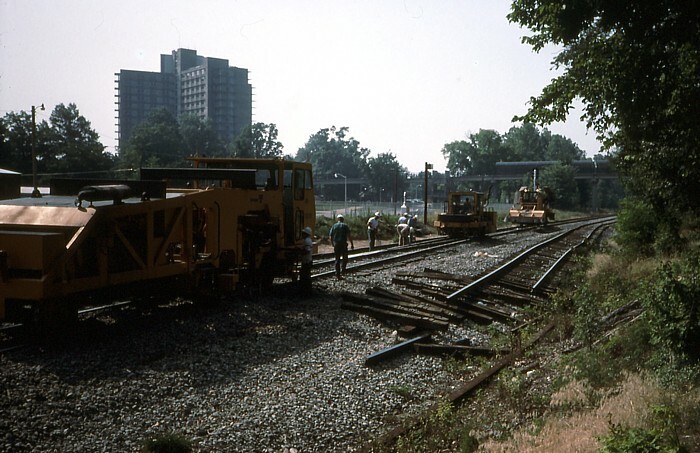 Any relaying of track, even for a passing siding, also involves that cable project. This makes any such project more complicated, as well as more expensive. Either way, it is a moot argument; what’s past is past and the rest is pure speculation. I was just off three years. at that time period I was on the Peoria dist. Still working 42 yrs. and counting. Just discovered your site upon reading the Cobden wreck and have been reading several more… Very Interesting! I became a fan of the ICG during my college days at SIU from ’78-’81 and lived near the tracks south of Carbondale. Always traveled to/from C’dale along U.S.51 to see what traffic I could catch and pace. Wish I was into photography then as I now model the IC in HO scale in the 90’s era (freelance), so I have a mix of the ICG into the new IC in the final stages of its life. I was saddened to hear the news when they decided to single track and knew that was signaling an end, and then heartbroken with the CN purchase/merger. My only hope was the new owners would double-track again for increased tonnage moving between Chicago-New Orleans. I live just 10 miles from the IC main and still frequent Centralia to shoot what remaining IC equipment there is. Keep up the great work for this website! Along The Rails is a collection of stories, essays and photo essays about railroads. Many of these are from a railfan's perspective, though some are also from the perspective of a railroader as well. Mary Rae McPherson is a longtime railfan, growing up near the mainline of the Illinois Central Railroad in Carbondale, Illinois. After traveling about the middle third of the U.S. in pursuit of operating steam locomotives and railroads in general, she went to work at Amtrak in 2000. She has been a passenger conductor on the railroad ever since, and still manages to continue her hobby of railroad photography.